← Midweek Top Ten Funny Facebook Quotes – Vote Now! Let me start out with the results from the Midweek Funny Facebook Quotes Poll. Funny thing, my sister had the winning Facebook status update. I think she may have coerced her friends to vote for her “Big River” quote. Here are the remaining results: #10 – “man”; tied for #4 – Lifetime, synchronized swimmer, math homework, enthusiasm; ties for #3 – doctors, Mr. Snake, rootbeer; #2 – braces; and #1 – Big River. If you want to read the full quote, check out this link. Congratulations to the winner. I am sure she will be having a huge party with her friends. Love you Sis. 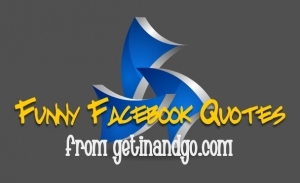 Now for this week’s Top Ten Funny Facebook Quotes Poll for this Friday. Again I love the polls. I think they are so much fun and it is interesting to me to see what everyone else decides is funny. I think they are all funny and my Facebook friends really make my weeks glide by when I am reading the funny things they say. OK Friends…I think I really want to start a Bikin’ Club….We can go in the morning or the evening or both…I would love to get lots of people out there and get moving and feeling better…I know I feel amazing after I ride and I want everyone to feel the same! So come on people lets get this going and starting getting fit! Comment: hahahahaha… I thought you said Bikini Club! I think my twins are aliens. Danced naked, buck naked, in the rain last night. I needed a shower and mother nature was offering. Comment: you have just branded my minds eye with that image. It will never leave me now. Comment: I’ll bet she is regretting that offer! wonder if drinking while on Facebook classify as drinking with friends??? Someone please convince me that going to the gym is better stress relief than the half of a bottle of wine in my fridge. This cold weather is harshing my gig. Was just accosted by my neighbor, she barged in my house with her mail in hand, to show me there was 2 twigs in it and bird poo on her paper. I just stared at her “hmmmm? ?” I said ?? she then goes on to say that this has happened 3 or 4 times since we moved in and she is sure my kids put twigs in her mailbox and leave it open for the birds to poop in…… SERIOUSLY!!!!!! Get a life lady.. Comment: what the heck???? Seriously barged in your house? She does need a life. Response: Seriously. She rang but when my daughter answered she almost walked over the top of her trying to get to me, I didn’t even have time to turn around, I had to trek it backwards!! One of the weirdest conversations I’ve ever had. Comment: The funny thing about people like that is it gets you thinking they deserve sticks and poop in their mailbox. Comment: well now it just gives you an excuse to do something….start brainstorming! Comment: I wasn’t aware that birds use twigs as bathrooms… I thought it was only freshly cleaned cars? Response: ok, yes. We capture birds and make them poop in her mailbox. We don’t have enough to do…Never in my wildest bad neighbor dreams did I imagine a lady wanting me to apologize for birdie poo poo on her newspaper… she kept telling me she pays “$40 A YEAR for that paper.” I think I am gonna pitch the same scenario for a Kandid camera show… Oh well… It kept me entertained for a bit. If only I had a dime for each time I came to getinandgo.com… Great read. Yeah! I won. I am so cool! Big River is going to be blasting today at work. Yeppers. I want to thank the academy and all the people who believed when I told them that I think I am that cool.